Mike Moore | The Journal Gazette Komets center Logan Nelson moves the puck down the ice in the first period against the Nailers at Memorial Coliseum on Friday. 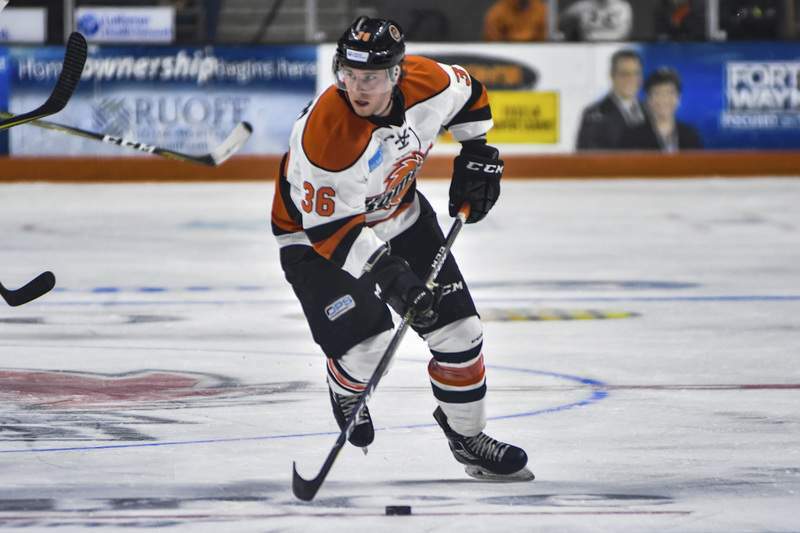 The Komets have been consistent this season – consistent at winning. Their 5-2 victory tonight over the Wheeling Nailers was their 13th victory in their last 16 games and, more impressively, only once this season have they followed a loss in regulation time with another such loss. There was such an opportunity today, with the Komets coming off a 5-3 loss Wednesday at Cincinnati, but they began a string of three games in three nights by defeating the Nailers. The Komets play the Quad City Mallards on Saturday in Moline, Illinois, and return to the Coliseum for Sunday’s New Year’s Eve game against the Toledo Walleye, before which “The Voice” star Addison Agen, who is from Fort Wayne, will sing the national anthem. The Komets, who are 2-0-0 this season against the Nailers, continue to have good fortune against Wheeling in games played at the Coliseum. The Komets are 7-1-2 in the last 10 games the teams played there, and have won 10 of the last 17 meetings overall. But this one wasn’t easy, not after the Komets squandered a two-goal lead in the third period before defenseman Bobby Shea’s goal from between the circles made it 3-2 at 15:23. Shawn Szydlowski finished off a 2-on-1 rush at 18:19 to cement the victory for the Komets (18-8-2). Mason Baptista added an empty-net goal. Michael Houser stopped 28 shots by Wheeling (16-12-2). The goal enabled the Komets to remain undefeated, at 11-0-0, in games they’ve led at the second intermission, while the Nailers are 0-8-0 when trailing after two periods. Dennis Kravchenko opened the scoring 5:12 into the first period, on Fort Wayne’s second shot of the game, when he eluded defenseman Zach Tolkinen and snapped a shot from the bottom of the left circle past goaltender Will King. On the ensuing faceoff, Fort Wayne’s Taylor Crunk fought Wheeling’s Jeremy Beirnes. Fort Wayne defenseman Ryan Lowney kept the puck in the offensive zone to set up a bang-bang passing play from Gabriel Desjardins to defenseman Ryan Culkin, whose shot from 45 feet out took advantage of a Louick Marcotte screen to reach the back of the net for a 2-0 lead at 10:18. Wheeling outshot Fort Wayne 14-9 in the first period but couldn’t solve Houser, whose slide to his left to foil a Kevin Schultze shot from point-blank range in the final minute of the frame. Houser came up big again by stopping Cody Wydo, who was all alone in front of the Fort Wayne net after a turnover at 3:20, to preserve the 2-0 Komets lead. Fort Wayne held Wheeling without a shot for the first 8:25 of the third period, when Houser foiled a Colin Murray shot from the right circle, and a few seconds later Houser sprawled to stop two Nick Sorkin shots from the opposite side. The Nailers finally solved Houser at 11:11, though, when he was on the ice and unable to thwart Cam Brown’s shot into the top of the net off a rebound. And the Nailers’ Reid Gardiner tied it at 2 with a shot from the left circle at 13:29. The Komets were so overloaded with bodies earlier in the week that they dealt forward Joseph Widmar to the Greenville Swamp Rabbits for future considerations just to make room. Then, Marco Roy was called up to Utica of the higher-level American Hockey League on Thursday and Artur Tyanulin returned to Tucson of the AHL today, leaving the Komets scrambling just to field a full 18-player lineup. They claimed forward Justin MacDonald off waivers from the Adirondack Thunder, for which he was scoreless in five games, and he was in the lineup. In 16 games this season with Evansville of the lower-level Southern Professional Hockey League, he had 12 goals and 24 points, after totaling four goals and eight points in 29 games last season with Cincinnati and Indy of the ECHL. Notes: The Komets remained without forwards Jamie Schaafsma (illness), who is the team captain, Justin Hodgman (shoulder) and Zac Larraza (leg), and goalie Sean Maguire (Tucson). … The referee was Sean Fernandez.